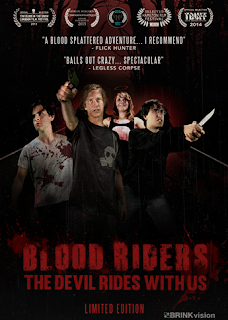 Behold a new modern blood splattering Cult film for today. This is a wild, bloody horror inducing Drive-In flare at its coolest. Brinkvision brings out another truly interesting, comical and bloody good time. I thought this was a perfect Drive-In B-movie with everything to hold the viewer, and send them into a twisted reality that only an original comedy horror film could do. 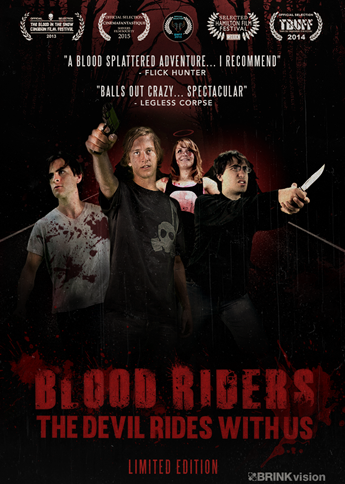 Some friends, a stolen car, a dead body, and an adventure into blood. I really liked this horror comedy. It was a laugh out good time, and a film that lingers with you. The movie is something to highly recommend to those who love horror comedy. This is one wild road trip of imaginative workings. When you go into a movie, and realize the bodies are piling up, Neo-Nazi’s, Satan lovers, and the concept of bringing Hitler back, you know you’re in for a treat of Drive-in, late-night, Ghoul Hosted entertainment, that only a screwed up mind could think of, and that is why this film works. Weird perfection. Possibly one of the best, weirdest plotted films I have seen in a long time, if not ever. I swear I don’t think I have laughed this hard in a very long time. I can see why this film has gotten a lot of the buzz it has. Winning awards, and being expressed throughout the film festival market. It deserves all the accolades. I truly think this is a one of a kind experience that gives a concept of horror with equal’s parts comedy, and is an all around good time. Simply put this is great entertainment. This is written and directed by a new comer. Lari Teräs' feature film debut, and what can be said other than, wow. I feel Lari Teräs' has a strong ability to create a memorable film, and I cannot wait to see what’s next. I think something that stands out the most is all the players in the film. Each character is unique, and is expressed in away, created, and given at times an in-depth approach to each character. The plot continues with one character ordeal after the other. And what is so shocking about that reality, is because everything that needed to be done, or dealt with, happened in the short time period of a little over 70 minutes, which is a total shock to me. It wasn’t too long, it wasn’t too short, and it had everything happening in a nonstop pace of actions, blood, and one trip that can’t be forgotten. Starring a wonderful cast. I think Corey Lof, A.J. Morabito, and Caitlynne Medrek all stood out in utterly perfection in their characters. The whole cast leaves a memory. I think this was a wonderful choice for Brinkvision to bring out on this great DVD. The special feature of the audio commentary is also a wonderful listen. This is a perfect choice for Brinkvision DVD, they saw the original, interesting reality that this film details. I highly recommend it for those who love this style of entertainment.